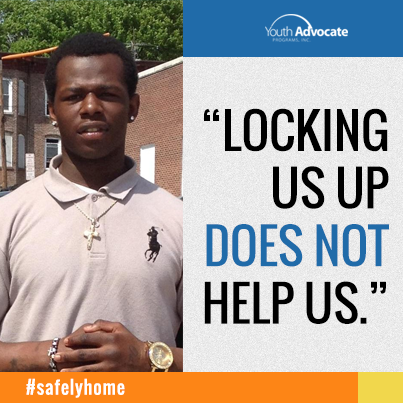 Youth Advocate Programs (YAP) released a new report, “Safely Home,” which adds momentum to a growing movement to drastically reform the juvenile justice system. YAP’s report makes a strong argument for reducing incarceration and investing the savings in doing so in community based programs that serve youth. “Supporting youth and families in their homes and communities should be the default for justice-involved youth, and incarceration the last alternative,” the report states. YAP is a national youth serving agency that provides community supports to high risk youth. Numerous studies have found that involvement in the juvenile justice system, even while controlling for other factors, causes youth to have worse outcomes. One study found that for youth who commit non-violent crimes, which are the majority of youth in the system, “doing nothing” creates better outcomes than placing them in the juvenile justice system (Gatti, Tremblay and Vitar, 2009). And while many youth enter the juvenile justice system having experienced tremendous trauma, which is often what led to their delinquent act, the system frequently further traumatizes youth with horrible treatment inside of prison-like facilities. Not only is the system failing, it is also extremely expensive. Nationally, juvenile incarceration averages $88,000 per year for each youth (American Correctional Association, 2008). Some places are much more expensive. California spends more than $200,000 annually to incarcerate a single youth in a state facility and more than $100,000 a year for each bed in a juvenile detention center. The evidence is clear: juvenile incarceration is ineffective, harmful, and excessive expensive. It is time for massive reform of the system. The good news is that YAP’s report highlights several programs throughout the country that have been successful. The study points out jurisdictions that have already significantly reduced their juvenile incarceration rates. For instance, Alabama went from 3,340 youth in custody in 2006, to 1,485 in 2013. Lucas County, Ohio used to have 300 youth committed to the state system in 1988, a number that is now all the way down to 17. Though not directly mentioned in the report, California has also had a drastic drop in juvenile incarceration. The state’s Department of Juvenile Justice used to have 10,000 youth inmates in 1996, today there are less than 700. While this is certainly cause for celebration, there remains 70,000 children incarcerated in America, and hundreds of thousands more on probation. There is still much work to do. A few jurisdictions around the country are beginning to implement major reforms of their systems with significant success. In Washington, D.C., the Department of Youth Rehabilitation Services replaced its old deficit-based, punitive system with a Positive Youth Development approach. Since D.C.’s reform effort began in 2005, the recidivism rate of youth in the system has plummeted, and the number of youth receiving services and supports in the community has skyrocketed. Youth Advocate Programs’ report is an inspiration to those of us who are working to reform a broken system. Though there are signs of progress throughout the country, we can do much better with young people who get in trouble. Safely Home provides a road map of how to keep young people in their home, serving their needs in their neighborhood, and keeping the community safe. David Muhammad is the National Director of Justice Programs at the National Council on Crime and Delinquency. For more about NCCD, visit www.nccdglobal.org.